This photograph gives a good idea of the splendour of the outside lid painting, the spine decoration and the stand. The inside and the outside of the case are decorated on a ground of thick gold leaf with oil paintings on top of the gold, a process known in the eighteenth century as ‘vernis martin’. The painting on the top of the lid has been attributed to François Boucher, Paris, 1750, and the decorations around the paintings and on the spine are attributed to Christophe Huet, Paris, 1750. These paintings and decorations have now been cleaned and, once restored, the affected parts should look particularly brilliant and beautiful. 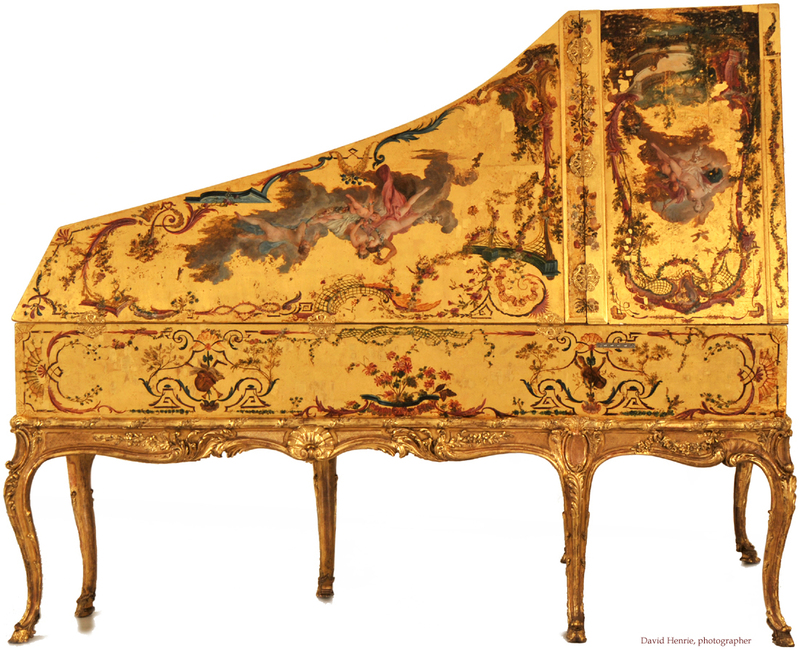 This is the only example in the world of a French 18th-century harpsichord with a decorated spine! The stand is particularly fine and beautifully carved and gilded. The height of the stand is greater than normal and raises the instrument into a high playing position.